If your ideal holiday is less strolling around a new place taking in the sights and more dangling four hundred feet above them, then this is for you. From coming face to face with sharks and lions to extreme sports that get your heart racing, these adventure activities from around the world will be sure to appeal to the adrenaline junky in you. Taking the scenic route really pays off in Switzerland. The bottom line is that any place where you can hurl yourself out of a plane and float majestically over the snow-capped Swiss Alps simply has to feature on any red-blooded adventurer’s do to list. There are tons of places in New Zealand that invite you to throw yourself from the relative comfort of a sturdy bridge with only a single cord separating you from nose diving into the water below. 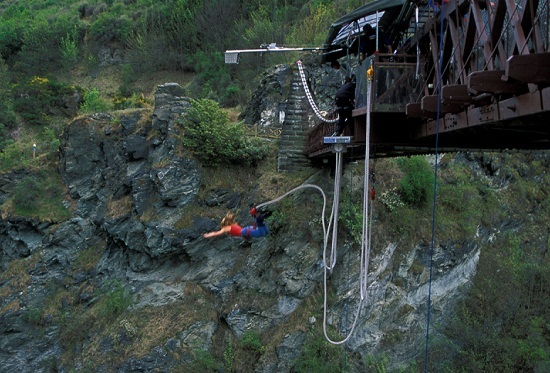 Most will agree however that Queenstown offers the very best opportunities to do just this, and the Kawarau Bridge jump comes up trumps not only for its spectacular views but for the kudos that hosting the first ever bungee jump inevitably gets you. For a slightly slower pace (but not for those with vertigo) climbing the Sydney Harbour Bridge is one of those must-do-before-you-die adventure activities. Anyone who is relatively fit and healthy can do the climb and will be rewarded with the most spectacular views across one of the most beautiful cities in the world. Choose from a day time, twilight or night time climb and don’t look down until you’ve reached the top! Whether you ski or snowboard (or something in between), Whistler Blackcomb in Canada is the ultimate resort for fun seeking snow addicts. They say you haven’t seen powder until you’ve been to Whistler, plus the trails offer the very best in skiing and snowboarding for beginners and experts alike. Even the lifts here are adventurous – a peak to peak gondola transports you between two snow covered mountains suspended some fifteen hundred feet above the nearest tree top. Back to New Zealand now and if you prefer your death-defying escapades to play out a bit closer to Earth then perhaps zorbing is more your thing. Zorbing involves climbing inside a large plastic ball and rolling down a hill at a speed of up to fifty kilometres per hour with just a cushion of air protecting you from any lumps and bumps along the way. Another adrenaline inducing activity to originate in New Zealand (no surprise there), zorbing has now grown popular all over the world, particularly in South East Asia. Not to be confused with our last activity, shark cage diving near Cape Town can be found on only the bravest of travel adventurers’ bucket lists. 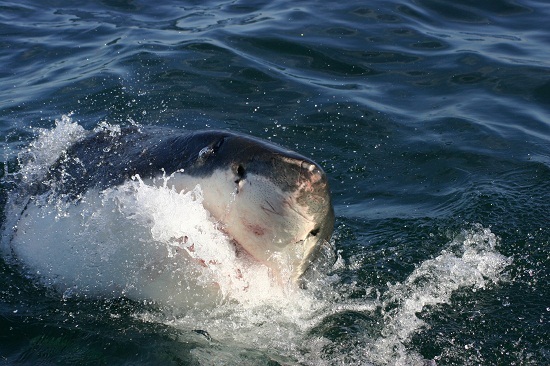 Lowering yourself into a cage and rubbing noses with Great Whites is most popular just off Gansbaai (about two hours from Cape Town) in a strip of shark infested water between Dyer Island and Geyser Rock. Exhilarating, yes, but not for the faint-hearted. Paragliding is another one of those adventure activities that you can do almost anywhere in the world – where you can find a mountain you’ll be sure to find somebody to supply you with equipment to fly off of it. The best thing about paragliding in Mendoza is the mountainous view as you soar through the air like a bird of prey. The second best thing about paragliding in Mendoza is that it is a lot, lot cheaper than paragliding in many other parts of the world. Our penultimate outdoor adventure activity, white water rafting in Alaska combines adventure with awe-inspiring nature in its purest form. Alaska is home to some of the most pristine stretches of wilderness left on planet Earth and white water rafting there draws in thrill seekers from all over the world. 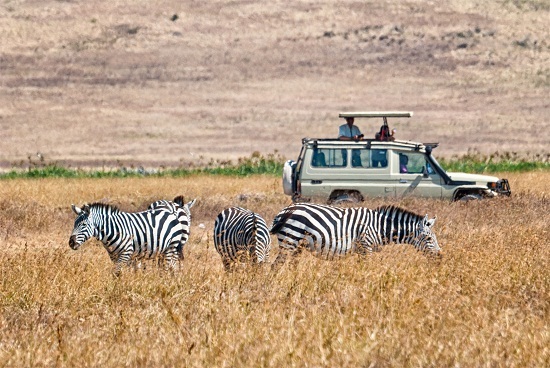 If it’s a wildlife adventure you’re after then it doesn’t get much better than going on safari in Kenya. If you thought safari was just about spotting the ‘big five’ (lion, leopard, elephant, rhino and buffalo) then think again; Kenya is the land of contrasts and home to a vast diversity of wildlife. What’s more safari is not just for the fully grown adventurer these days, as more and more people are taking their whole families to get up close and personal with the big cats. So there you have it – our top ten action packed, adrenaline fuelled adventure activities from around the world. Now what would you add to the list? Kirsty Stuart left full time employment last year in a perilous bid to write more and travel more. Her plan worked and these days she enjoys doing just that while also helping other writers and free-spirited entrepreneurs do the same via her website Freelance Writers Online.